This is a review of the brand new comic book The Stalker. 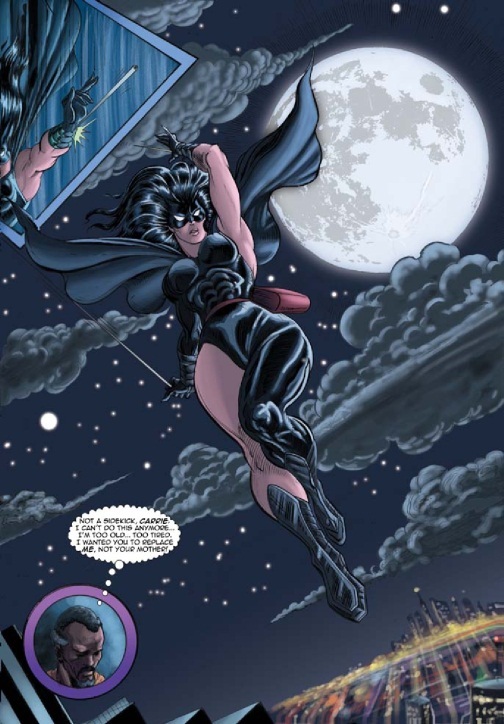 The writer is Bradley Potts, a newcomer and the seasoned artist, Trevor Von EEden (http://www.trevorvoneeden.com/). Von Eeden has done art for various DC titles including Black Lightning, Batman, Green Arrow, and Black Canary. 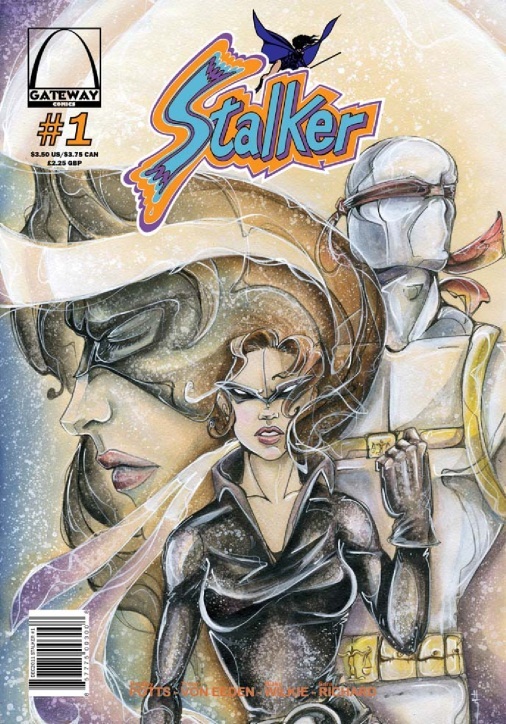 The Stalker is published by Gateway Comics(http://www.gatewaycomicsonline.com/). The Stalker is a story of vengeance but with an interesting twist. The Stalker is female and has been the sidekick of the Defender for years. Her mother had been the Stalker with the Defender before being murdered. In this first issue the new Stalker decides that in order to avenge the death of her mother, she must break out on her own. Generally comic books do not spend a lot of time on back story in the first issue but Potts does. This makes the characters more multidimensional and interesting than is usual for comic books. The Stalker inhabits a complex universe. The art has some unique features. There are a high number of panels per page and I am sure this is a deliberate effect from an experienced artist like Von Eeden. This dense panel format gives the reader a sense of walking through a labyrinth and this effect matches the narrative of the story nicely. 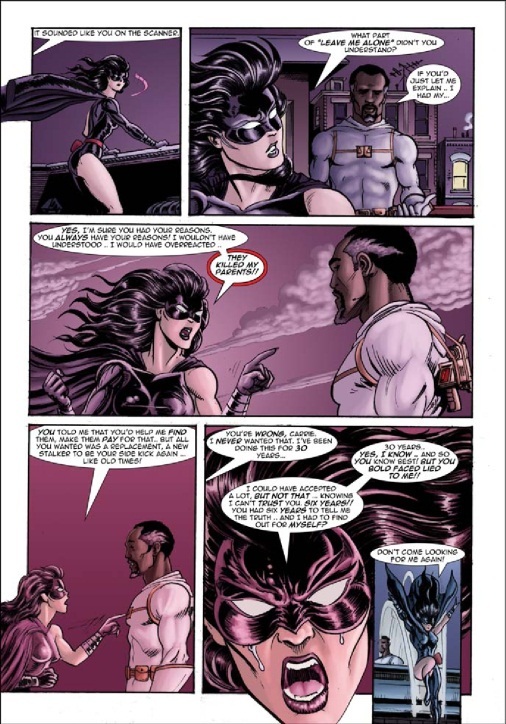 The use of borderline monochromatic coloring in certain pages and certain collections of panels adds to the visual drama of the comic book. There is an almost Tarantinoesque quality to the street scenes. The action scenes are dramatic. The Stalker is portrayed visually as having a balletic fighting style that is in contrast to the more brutal fighting style of the men in this universe. This is a gritty street level universe that Batman and Black Canary would understand and Von Eeden’s prior work with those titles shows. Overall, The Stalker is a good read and I looked forward to the next issue of the plot arc Donning the Mask that has started with issue #1. This entry was posted in Comic Book Critique and tagged Batman, Black Canary, Black Lightning, Bradley Potts, Gateway Comics, Green Arrow, The Stalker, Trevor Von Eeden. Bookmark the permalink. Thanks so much for the positive review Hugh. Everyone who worked on the book is very proud of it, but it’s always nice to hear it from someone else. Issue 2 is all colored and I am lettering it now, and inks for 3 are done. The book can be read online or print copies ordered from the website. In addition, if your in the St Louis area, you can pick up a copy at Category 5, Fantasy Books, or Twilight Comics. Hopefully we’ll add more shops soon. Good luck on the second issue! So, the initial release had some issues. Diamond rejected it, and the old website just wasn’t very well thought out. For those who missed it, and admit it, all of you did, Stalker #1 is being re-released as a web comic at http://www.sunday-superheroes.com as a weekly release. Please come on out and give us a look. Stalker #1 starts at http://www.sunday-superheroes.com/Ep001.html. Well at least you are getting it out there one way or another! Good Luck! Thought it was time for a little update on Stalker. The webcomic is doing well. It’s the 18th most read comic on Tapastic out of almost a thousand. I’ve been favorited by over 200 readers between Tapastic, Topwebcomics and Comic-Rocket. After 42 weeks of publication, Stalker #2 will be wrapping up this Sunday 10/27. I thought this would be a good time for you and you’re readers to pay a visit and catch up with our heroine. Thanks for the update! Seems like your webcomic is doing very well!